Blurb: Klayton continues his nerdy love letter to the ‘80s with an album that furthers the aesthetics of the self-titled debut, but with a wider focus that is less centered on the standard cyberpunk narrative and allows each song to live in its own respective world within. Never a man to limit the scope of his creative output, Klayton has demonstrated with his various projects a great musical proficiency in any genre he chooses to explore. With Scandroid, he indulges in his affinity for the synthesized wonder of the ‘80s, drawing on the atmospheres of the electronic soundtracks and new wave pop of the decade. The first self-titled album plunged listeners into the futuristic android populated world of 2517, where amid the urban sprawl of the neon-lit Neo-Tokyo we follow the exploits of the revolutionary figure known as Red. As the trend of synthwave has become rather oversaturated and shows little sign of slowing down, Klayton’s prowess as a producer and songwriter gave Scandroid a depth of sound that few could match, and the same can be said of the follow-up album, Monochrome. As “2517” had done on the previous album, “2518” begins Monochrome as a synthesized overture, the opening sweeps strangely reminiscent of Rush’s “2112” until a pulsating bass, resonant melodic refrains, and Klayton’s robotic yet emotive vocals enter to dramatic effect. “Afterglow” then launches us into a strident and danceable rhythm with an infectious vocal and celestial synth and guitar melodies that are quite simply catchy-as-hell. Similar tracks in this vein appear in the form of title track “Monochrome,” “Future Bloodline,” and “The Veil” as harmonious vocoder vocals and vibrant synth and guitar leads and solos adorn a juggernaut rhythm that may lead to speeding treks through rain swept city streets, while the vocal hooks of “A Thousand Years” are impossible not to sing along with. The instrumental “Oblivia” takes a slower, more ambient approach as it introduces its namesake character in a flurry of poignant arpeggio melodies and angelic synth chords, the rhythm and switches between major and minor key solos adding an epic quality that is offset by saxophone-esque solos that evoke the sort of bluesy feminine allure that reminds this writer of Glenn Frey’s “You Belong to the City.” On a similar note, “On the Face of the Deep” offers a monstrous vibe with its discordant waves of acerbic synth chords wavering in and out of key, a throbbing caustic bass shifting in stereo adding to the song’s dissonant menace, while the instrumental “Searching for a Lost Horizon” is a fine display of strength in minimalism, fading in with an ascending/descending arpeggio bass line that is only occasionally augmented by additional synth refrains evocative of the Stranger Things theme. But the real stars of this album, oddly enough, are the cover tracks. Klayton tackles Michael Jackson’s “Thriller” with audacity and vigor, delving fully into the song’s blend of funk and spooky rock hooks with the sort of bravado that only a man of his talents could successfully achieve; he even goes so far as to perform the Vincent Price “rap” section himself, and while his pseudo-British inflection actually sounds somewhat silly, it works… it really works. And then there is “The Force Theme” from Star Wars, which is a wonderful complement to his earlier Celldweller rendition of “The Imperial March” and is an excellent example of his arrangement and compositional skills. Somebody, please hire Klayton to score your movie or video game! As richly textured and slickly produced as anything Klayton has ever created, Scandroid’s Monochrome does well to strengthen the aesthetics established by the previous album. 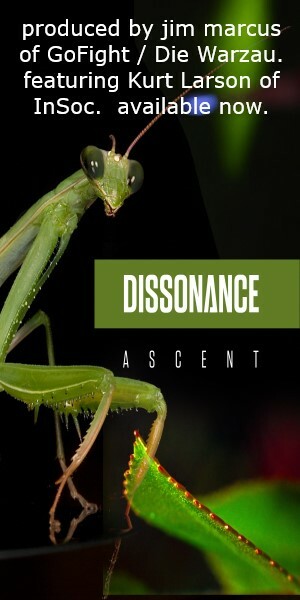 However, where this writer found the cyberpunk narrative of the first album to be one of its weaker qualities as it did little to stand apart from other similar story concepts in music and other media, this record seems to have a wider lyrical and thematic focus. 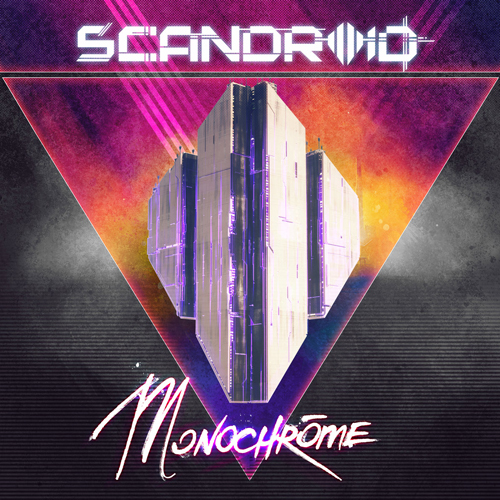 Though the opening track and certain lyrics call out to the first album, Monochrome is not a sequel or a continuation of Scandroid’s story, giving the songs a more self contained feel that is perhaps better suited to the project’s synthwave propensities. After all, that scene is filled to the brim with artists creating their own soundtracks to worlds inspired by Blade Runner, The Terminator, Escape from New York, and the like, so the themes of technological oppression and subjugation of the human spirit are still present in Scandroid, the dynamics of color replaced for the cold logic of Monochrome. But somehow, it feels less contrived on this record; more of a backdrop for the songs to live in their own respective bubbles, further differentiating Scandroid from the rest of the pack and making Monochrome a marvelous successor to the self-titled debut.